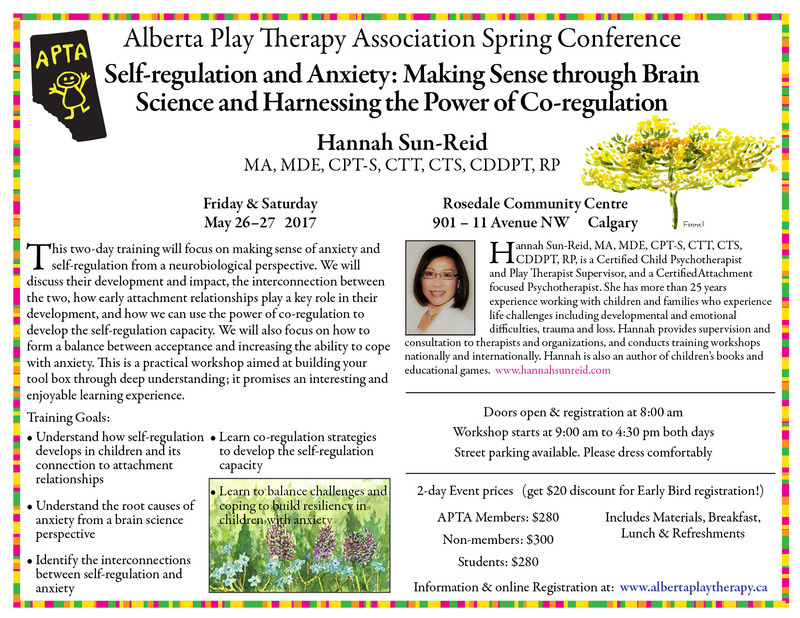 Hannah is a Registered Psychotherapist (RP) with the College of Registered Psychotherapists of Ontario, Certified Child Psychotherapist and Play Therapist Supervisor, a Certified Theraplay Therapist, a Certified Trauma Specialist, a Certified Dyadic Development Psychotherapist, a Sandtray-Worldplay Therapist and an EMDR therapist. She has more than 20 year’s experience working with children and families who experience life challanges including trauma and loss. Hannah provides supervision and consultation to therapists and organizations, and conducts training workshops nationally and internationally. She lives and works in southern Ontario, Canada. This two-day training workshop will focus on making sense of anxiety and self-regulation from a neurobiological perspective. We will discuss their development and impact, the interconnection between the two, how early attachment relationships play a key role in their development, and how we can use the power of co-regulation to develop the self-regulation capacity. We will also focus on how to form a balance between acceptance and increasing the ability to cope with anxiety. This is a practical workshop aimed at building your tool box through deep understanding; it promises an interesting and enjoyable learning experience. This two-day event offers 12 Hours of CACPT Accredited Training (Technique). Foundation Training Hours applicable to CACPT Certification are also available upon examination (additional $40 fee).